Audio Classics has the three essential elements required to give you the best possible repair service on your stereo equipment should it need it. 1. Professional and experienced repair technicians whose knowledge is continuously upgraded to keep current with the rapid changes and advances in electronic technology. 2. Today's sophisticated circuits and electronics require sophisticated test instruments. Dual trace scopes, distortion analyzers, alignment generators, and more are all a part of the more than $30,000 investment we've made to protect your investment. 3. You are assured of the quickest repair possible using the correct parts and procedures. Rapid, complete service depends on rapid receipt of authorized factory repair parts. Audio Classics uses the fastest method of communication consistent with factory requirements. Audio Classics is committed to you, your enjoyment and your peace of mind. ATTENTION MCINTOSH TUNER AND TUNER PREAMP OWNERS (any model, any age) NOW Your McIntosh Tuner or Tuner preamp will perform even better. RICHARD MODAFFERI has agreed to do repairs, modifications and updates for customers of AUDIO CLASSICS. His intimate knowledge of the circuits allow him to improve the units audibly and measurably beyond their original performance limits. Your investment in this service is protected by a limited one year parts and labor guarantee. Service Related Feedback: Re McIntosh MR78 repair: It arrived Friday and I have been listening to it all weekend. I think it actually sounds better than when new...R.B., WA. Re NHT amp repair: It sounds very quiet...... It sounds very good. I appreciate your help. Pass the word on that I am very satisfied with the repair job. M.D., NY. Thanks for spending so much "quality time" with my MC225. It now sounds better than ever before (and that's saying quite a lot, because it was super before the R.M. treatment). I am happy to report that the demons are now exorcized and I am a very happy camper. A big bonus to me is that my amp was worked on by an industry legend. Thanks again. 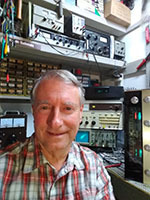 P.G., Pioneer USA, GA.
Mike, I am SO happy I became acquainted with you and Audio Classics. I think it is great that Mr. Modefferi is so throrough and careful. PLEASE pass my thanks and regards on to him. R.F.,S.C. I would like to thank Richard for developing such a great product. The MR-78 provides great overall performance, and I'm looking forward to enjoying the unit even more after Richard is through with it.J.L., MI. I sent my MR78 for the full "Moda-Mod". To say that I am happy or satisfied with your work is an understatement! ... this MR78 now outperforms, in any specification or subjective criteria you wish, a number of 1990 state-of-the art tuners as well as a fully restored 10B. The quality of workmanship, packing and the fact that some of the work I requested ... was performed at minimal or no cost, make your service an excellent value. J.W., MD. I wish to thank you for a most impressive upgrade of my MC40 amp. Your responsive courteous and professional approach to business was most refreshing. F.B., CT. I recently purchased an MR78 with the modifications of Rich Modafferi, from you and I am wholly pleased with it. ... The '78 is dynamite. J.Y., OH. ..my modified MR78 is nothing short of spectacular in terms of sound and soundstage. Thanks for a great job. R.F., NJ. Once again, I bow and kiss your gnarly feet. Thanks for helping me troubleshoot yesterday. Now I know why I've resisted selling off my "spare" 2155! Nice to have a back-up, and I still think it's one of the loveliest amps Mac ever made (not too big, not too small, great punch, etc.). Speaking of which, having now really heard what my refurbished 225 can do, you can bet I won't be selling its "spare" brother either!! I know that by real high-end status, I'm a "mid-high" audiophile. But the synergy you have helped me achieve on my budget, the intense love and respect you have helped me form for my classic Mac gear, is all I'll ever need. I'm happy. I listen to a lot of music. My systems are musical.Thanks as always for being there for me! J.M., MD. Thanks for bringing my McIntosh 4300v receiver back to life. It sounds better than it ever did. J.R., N.Y. I would like to take this opportunity to thank you for the wonderful service you provided when my Mac 250 started to act up in a rather mysterious fashion. I picked it up at Audio Classics on March 1st and have been running it ever since and it has been truly fixed! You did a great job on this unit! I have turned it on and off repeated times and have run it for hours on end and I can truthfully say that it sounds better than it did when I first bought it.... The 250 does in fact sound �tubey� and somehow really the La Scalas sing...and I am most pleased to have this beautifully rebuilt unit in my amplifier stable� I really appreciate the time and effort you put in the 250 redo and the fact that you telephoned me to help get to the heart of the problem really shows how much you care for the welfare of the client. Audio classics is very fortunate to have you to turn to when the going gets rough and a component needs that special someone who knows the ins and outs of all the Mac devices from the tube era on up to today� and you are that man! Thanks again for solving an enigma and returning a classics piece of audio to the land of the living. S.T., PA. Thank you so much for working with me on this...and I'll be emailing Ryan a big "thank you" also for all of his consideration in this matter. AC is number one in my book and I'll keep coming back for more! Is George your relative? George did a terrific job of finding the gremlins in a Mac 250 power amp I bought in January...he is a genius and can fix anything, that's for sure! It now sounds amazing! Again, thank you for everything! S.T., PA.
RE: MC240 Repair It sound great, better than I've heard it sound in the 25 years that I've owned it! Ryan was a pleasure to deal with, he was helpful and informative, and got it back to me quickly. I had a very tight schedule and he worked it out to meet my time frame. You have a new and very satisfied customer! Thank you and please thank Ryan for me, I owe him one. J.W., MO. Just a note to let you know I received the Marantz 10B tuner today without incident. It's perfect; it arrived in such great condition and so beautiful! You were right; Audio Classics certainly know how to pack up a tuner! The 10B is such a marvelous machine, and a pure joy to operate. Everything I imagined it to be, and more! Now I can enjoy, in the best style, what most likely will be the 'waning days' of analog FM listening in this country. Can't think of a better tuner to do this on than the beautiful Marantz 10B. Richard did a great job on this unit. It performs flawlessly, and sounds even better. In fact, I've never heard FM like this before! It's just amazing! I am happy. Again, thanks to you and Richard for this opportunity to own one of the world's best tuners in such excellent cosmetic and operating condition! R.H., CA. My MC240 & Mx110 were stored away for several years because they did not sound right. Ryan Kilpatrick described the quality of ACL's repair service. The entire process went smoothly, just as he promised. My sincere thanks to Ryan and with much appreciation also to Richard Modafferi. Richard, you are an true artist in your profession. The system sounds awesome, great job!Your shipping Dept takes a lot of pride in their work too. Keep up the good work. C.V., N.H.
Amp received and working. What a great packing job you guys do. So good I took pictures. You should brag more about it. It was a pleasure working with your team. The amp is purring as I write this - playing some great old Dave Brubeck on vinyl that sounds like he is sitting right next to me. You did an A-1 job cleaning up the amp and bringing it back from the dead - too many pieces to count. Well worth the drive from Rhode Island. J.S., R.I. If you are willing to drive to B'ton, then take it to Audio Classics. I am 4 for 4 on service jobs with them. Superstars. AudioKarma subscriber. � I just received my MA6100 back from a quick trip to Audio Classics in Vestal� George Melnyk gave it a good going over and restored it to what I can only imagine to be factory condition. He is a gem; there aren�t too many left like George. Ryan and the team at Audio Classics are spectacular to deal with; the entire service experience was wonderful�And, while I know that Audio Classics is not directly affiliated with McIntosh Labs, I just wanted to make it clear that � in my opinion � there are only a handful of companies on the planet that elicit the kind of passion that McIntosh garners � Porsche, Rolex, Singapore Air Lines. In the consumer audio space, there is only one � McIntosh. This machine came from Binghamton close to 35 years ago and still performs at levels that are head and shoulders above most of today�s equipment in the price range or beyond. And to have a passionate partner like Audio Classics, well� most companies would do anything to come even close to that level of third-party support. I�m a Mac customer for life. Thanks so much for making the music sound like, well� music. D.S., IL. MC60: Audio Classics cleaned up the units to look almost like new - far better than they looked when I left them for repair. Better yet they sound fantastic, much better than I remember when I replaced them for a better(? )sounding solid state unit - argh... where was my head? A.P., PA.
My Mac1500 arrived in perfect shape (thanks for retiring my old, beat up McIntosh box and sending along a fresh one), and I just finished getting it back into my system. It sounds great and is operating flawlessly. Please extend my thanks to Richard M. J.A., PA. I truly appreciate your time spent and advice. The guys at Audio Exchange were definately positive in mentioning you all, noting your willingness and ability to source high quality gear, and your service & support. They were clearly placing you right on par with the factory itself for your service and support, and noted only a couple primary differences ... That you all were generally quicker and more responsive when it was within your bailwick, and that the factory was ultimately more capable of resolving it beginning to end when things such as laser & disc drive repair were involved. Both to be expected, I'd say. For my part, I will continue to recommend you all, and I have even more confidence and reason to now. Can't say thanks enough, E.C., VA.
Just wanted to let you know that the MR73 arrived intact, looks fantastic, and is working very well. I appreciate the hard work by Richard Modaferri and everyone else involved. Thanks for the terrific service! A.G., OH. MAC1700: Just a note to let you know I received my receiver last week and it sounds terriffic. Nice Job! R.P., CA. Not sure what you are paying Ryan, but if you don't know (and I'm sure you do), you are getting him cheap. I've dealt with Ryan on several past Mc purchases.....most recently on the repair of my MC501's. As usual, he did an OUTSTANDING job. If you look on ANY Mc audio forum, you'll see that Ryan has become "the face" for your company. Please be sure to share with him, he did a fantastic job on the repair of my 501's. Congrat's on having such a wonderful employee. J.W., IN. I just wanted to let you know that I received the C37 and I'm enjoying it very much. It sounds and works great. Thanks for the great work, A.M., PA.